Justin Welby delivered a speech to the TUC, which went down well in one quarter, and not so well in five eighths, most of whom were irked that he delivered a speech at a manifestly political gathering. The criticism ranged from the absurd to the astonishing. First of all, please don’t presume it’s your job to tell the Archbishop of Canterbury what his job is or is not. It simply isn’t your job to set limits to Christian mission or to prescribe conditions on episcopal ministry. You may feel very strongly about what Justin Welby’s priorities ought to be, but if you determine his delinquency by his dedication of 45 minutes of one day to a TUC conference, you are guilty of judging by appearances (cf Jn 7:24): you have absolutely no idea how he spent the other 675 minutes of that working day, so no knowledge at all of whether it might have been good and pleasing in the sight of the Lord. If you wasted 45 minutes yesterday spouting your indignation on Twitter, how did that help to usher in the Kingdom? Secondly, please don’t dutifully churn anti-Welby reproach just because it came from one of your favourite politicians/journalists/commentators/priests. Lord Tebbit, for example, is of the view that ‘Archbishop Welby should promote Church attendance, not failed economic panaceas‘, and that “he might be better to deal with the failures of the Church of which he is the leader”, noting that fewer than one in seven people in England identify as being Anglican, which constitutes “a slump of some 16 per cent since Archbishop Welby took office in 2013”. And only 21 per cent of those apparently go to a church service once a month, so the Archbishop “might do better to devote his time to doing his own job before telling the Chancellor how to do his,” Lord Tebbit concluded in a post hoc ergo propter hoc kind of way. Imagine telling Jesus that he had no right to preach in public based on the fact that his small band of disciples was… well, small. Certainly, his followers might have flourished later, but the harvest isn’t always discernible after an hour of labour: the trajectory wasn’t foregone in 30 AD. And there’s another problem with Lord Tebbit’s prescriptive focus on numbers. Setting aside the inconvenient fact that Conservative Party membership (and supporters) has slumped far greater than 16 per cent over recent years, is it not written that ‘A prophet is not without honour, but in his own country, and among his own kin, and in his own house‘ (Mk 6:4)? And is it not also written that the wheat must be sifted from the chaff (Mt 13:12); that only a remnant will be saved (Rom 11:5); and that not everyone who calls Jesus ‘Lord’ will enter heaven (Mt 7:21)? 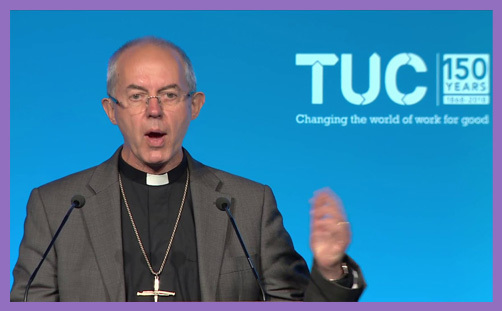 If God prefers the burning hearts of true disciples rather than the lukewarm church attendance of Sunday obligation, is it really appropriate to tell Justin Welby that he has no business addressing a TUC conference until Church of England attendance has been restored? And what level of attendance would restore that right? And who are you to impose this stricture? Thirdly, could we please cease this nonsense that by speaking to the TUC the Archbishop was somehow hitching his wagon to the red flag of socialism or to Jeremy Corbyn or to Momentum? And when the Pharisees saw it, they said unto his disciples, Why eateth your Master with publicans and sinners? (Mt 9:10f). The TUC is jam packed with sinners, and the Archbishop exhorted them toward justice, mercy and compassion, which is what trades unions ought to be occupied with. You can’t on the one hand say ‘Britain is a Christian country’ and on the other tell the Archbishop of Canterbury that some parts of Britain are off limits. If Jesus can sit down with tax collectors, prostitutes and lepers, then Justin Welby can sit down with Trade Union leaders, charity workers and NHS employees. And if he’s asked to address them he can jolly well do so, because Britain is a Christian country, and as leader of the Established Church he is responsible for the spiritual and temporal flourishing of all. The gig economy may be flawed, and zero-hours contracts may not be ideal, but in what sense are they the incarnation of evil? And if they are truly evil, are they not a manifestly lesser evil than unemployment and indolence? Is it not better to be engaged in some sort of gainful employment rather than unemployed and on welfare? And is it not preferable that gainful employment should be a better lot than receiving ever-expanding benefits? Is not temporary or short-term work better than no work? It isn’t at all clear why the Archbishop of Canterbury would focus on the ancient evil of worker exploitation without mentioning, at least in passing, the modern good of employer and employee flexibility. If, as John McDonnell proposes, all those employers engaged in the gig economy were suddenly obliged by statute to give their workers full employment rights – indeed, “the biggest extension of individual and collective rights the country has ever seen” – how many employers would find the costs unbearable and simply make people redundant? When did you last hear an archbishop or a bishop (or any priest, for that matter) talk about: ‘In Grantham, the discipline of running a grocer’s shop was taught diligently, and the ability to distinguish right from wrong, and good from evil, was instilled in the home as it was in the Methodist chapel. It wasn’t always easy to feed the family or balance the housekeeping, but Margaret Thatcher learnt from her father…’?